We’ve featured game programs before and certainly will again, but for today’s post we will focus on a collection of programs from a single collector. Because I really liked the way these particular covers fit together to show a progression of styles and… oh, who am I kidding? I love that he did all the work for me and provided not only great items to feature but also a nice little blurb on each. So, without too much blathering from me, I’ll hand it over to our generous contributor, Jim Naftel. Eat your heart out, Brian VanGorder. 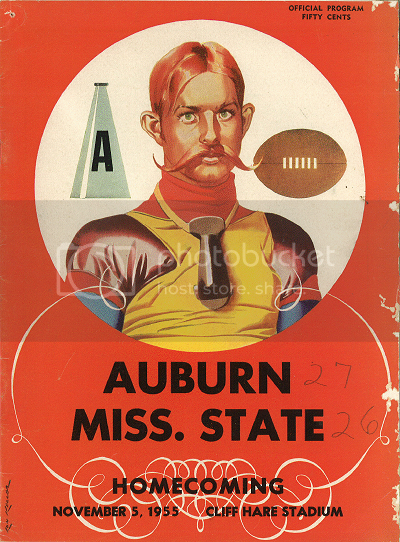 The greatest mustache in Auburn history belongs to the gentleman gracing the cover of this program and has since 1955. I have no idea if he is a real player or not, and I’m not sure what that is hanging around his neck, but I love everything about this cover. 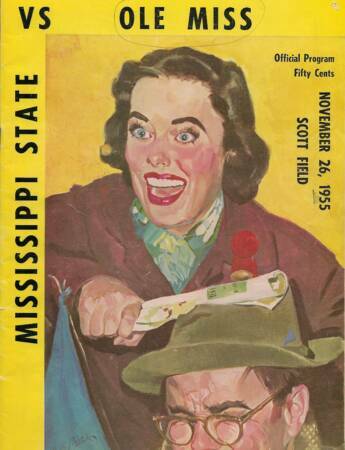 I also love that MSU was the Maroons. With Dan Mullen around, they really should bring that name back. Also note the hand-written score next to the schools’ names. You’ll see that on a few of the following covers as well. Auburn fan or not, that woman scares the hell out of me. There is crazy in those eyes. Seriously?! They brought crazy eyes back the very next week. I’ll have nightmares of that woman hitting me over the head with a rolled up program for weeks now. As I’ve said before, I have a particular affinity for cartoon animal on cartoon animal violence that likely stems from my love of Tom and Jerry and Looney Toons as a kid. It’s just not something you see much of these days. I’m not a fan of the UGA roadkill groom’s cake that made the rounds last week, however. If that’s where cartoon mascot violence was heading, I guess it’s a good thing that it’s not around anymore. 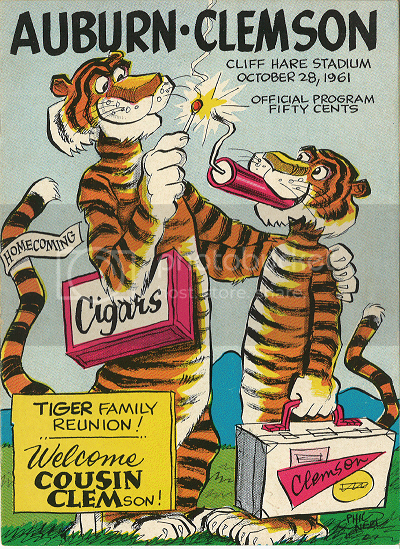 At least we’ll always have the works of Phil Neel to remind us what used to be. 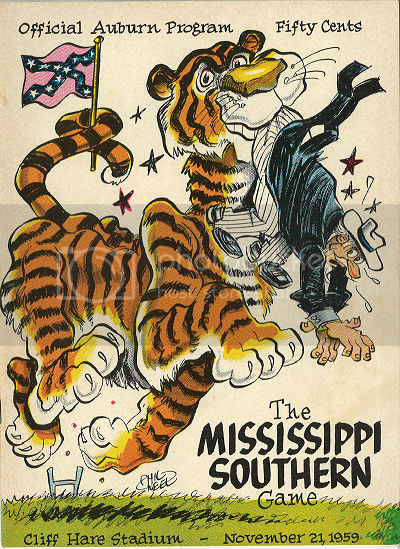 At this point in time Auburn’s opponent was still known as Mississippi Southern College and their sports teams were called the Mississippi Southerners. 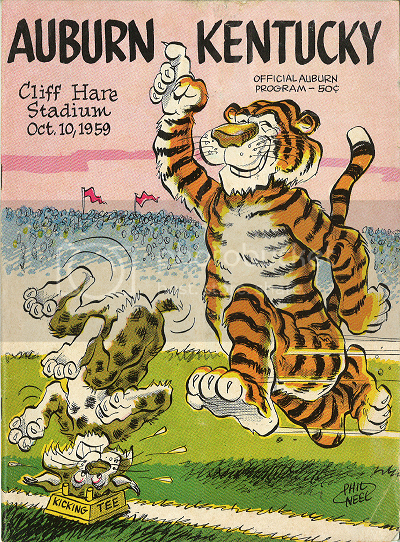 That would explain the Colonel Reb looking character and the now highly anachronistic rebel flag flying from Aubie’s tail. Southern Miss achieved university status three years later and renamed its teams the Golden Eagles in 1972. 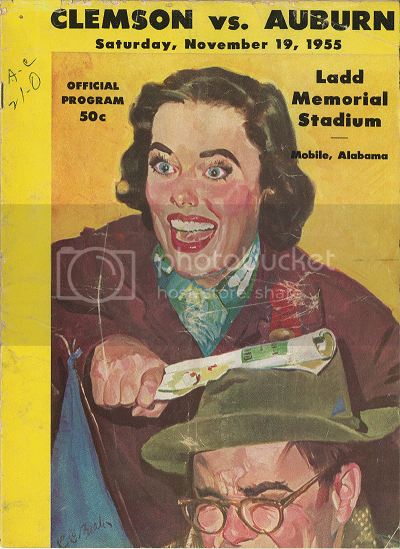 This is easily among my favorite Neel covers, which would make it one of my favorite program covers period. Here we see Aubie in the Auburn jersey that would become a regular part of his appearances moving forward. Naked Aubie was no more. That will do it for today’s edition. Thanks again to Jim for taking the time to dig up and scan all of these classic covers. We’ll be back with more Relics soon; you can check previous editions here while you wait. If you have something you’d like to share, please send it to me at [email protected] or tweet me @FearlessandTrue. Editor’s Note: TWER is currently in the process of building the greatest Phil Neel repository ever. Luke 12:48. “TWER is currently in the process of building the greatest Phil Neel repository ever. “……… AUsome news….I know this is going to be great! Nice! I wish they cast 50 cents too. 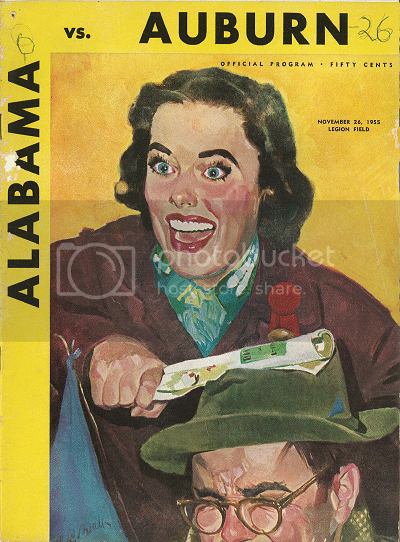 Courtesy of our friend @TheAuburner, we have learned that the crazy eyes woman really got around back in the day. 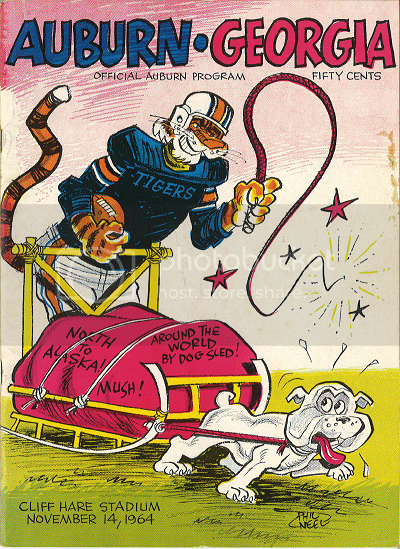 The device hanging around Homer Van Gorder’s neck in the first program is a nose guard. Take a close look at the photo featured in War Eagle Relics Goes Old School and you’ll see them hanging around the necks and in the hands of several players. Also, the team picture in the 1897 Glom (featuring J W Heisman) also displays the nose guards quite well. Dave, I figured it for some fancy schmancy moustache comb. Thanks.